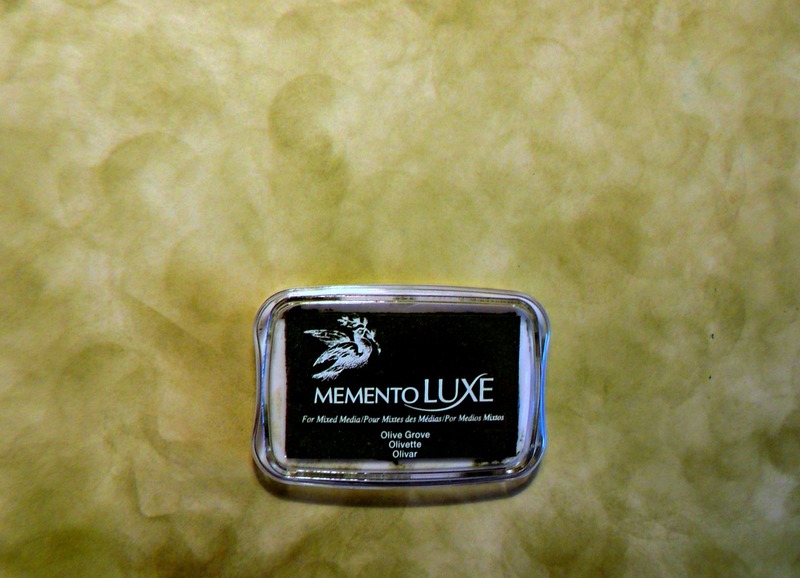 Create a master board using water color paper and Olive Grove Memento Luxe ink with a sponge tool applicator such as the Groove Tool. This enables you to make a series of cards with the same background paper. Use a diamond patterned stencil and a baby wipe to remove some of the color. 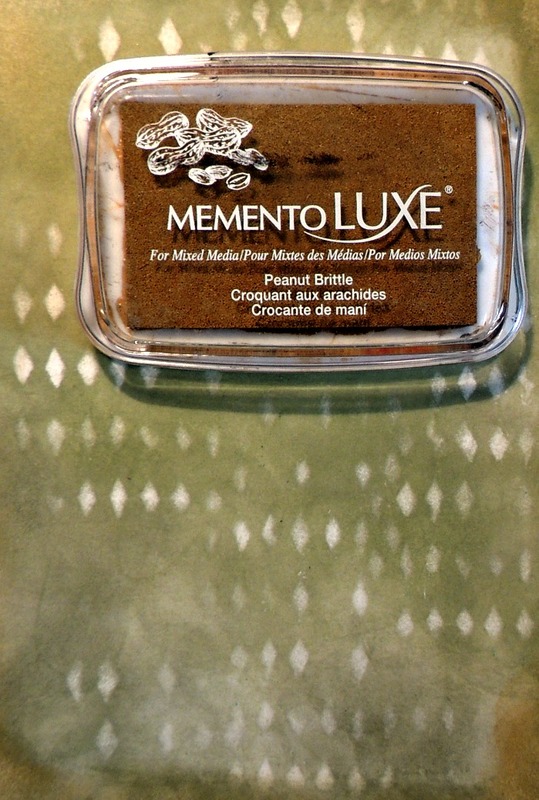 Cut a piece large enough to cover the front of the card blank and ink the edges with Memento Luxe Peanut Brittle and Elderberry inks. Add some Gold Delicata to the edges of the paper on top of the first two colors, dip in embossing powder and melt it with a heat gun. Prepare a panel to fit on top of this that by stamping the dress image in the center. Mask it off and continue to stamp around first stamp circles using Delicata Gold ink and then stamp flourishes using Memento Luxe Northern Pine. 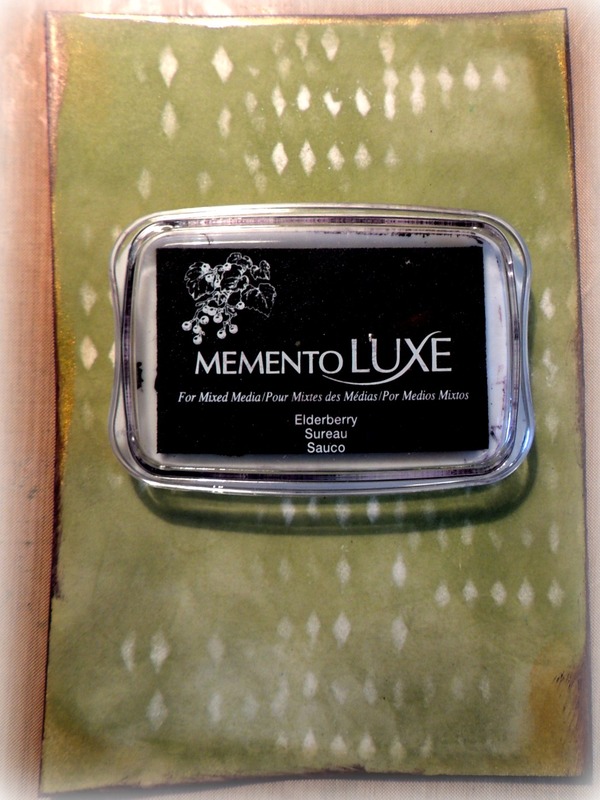 Sprinkle with clear embossing powder and heat set the background images. 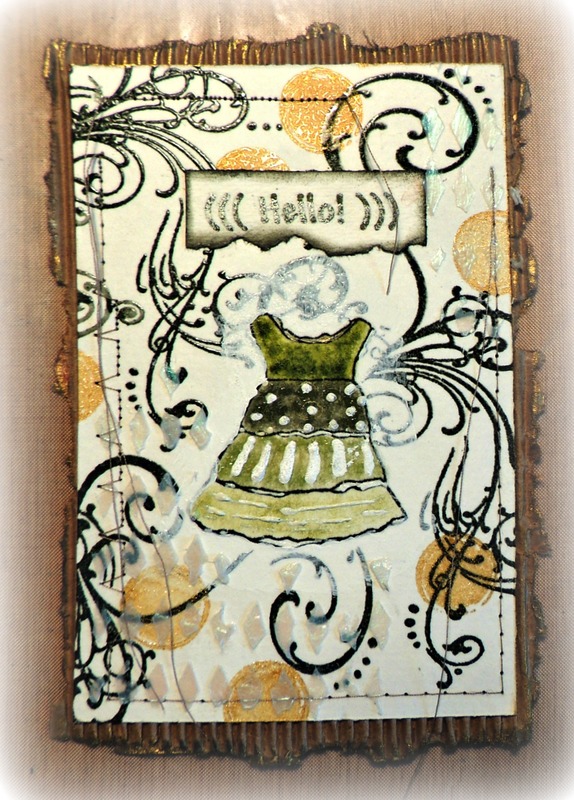 When the panel has cooled begin coloring in the dress with Memento Markers and a Pico Embellisher in Wedding Dress white. 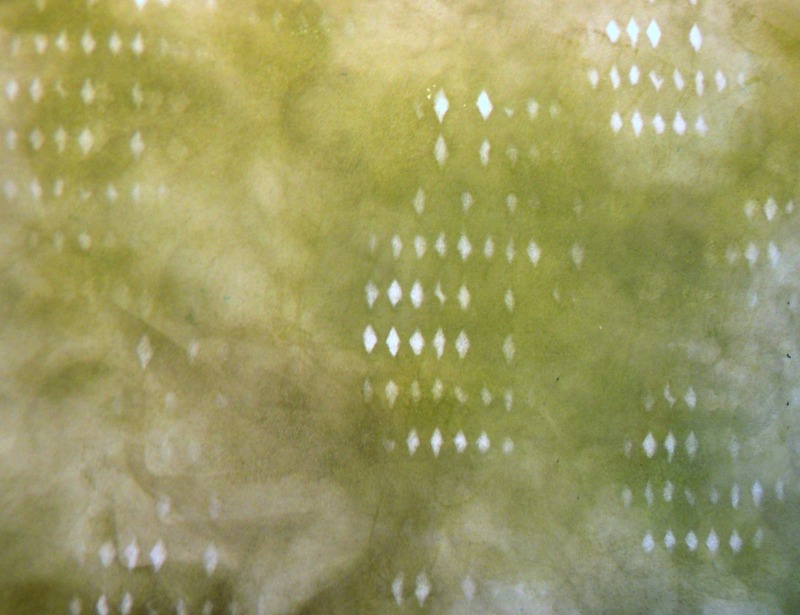 Use a diamond patterned stencil to create texture by applying Creative Medium Iridescent paste in Green color. 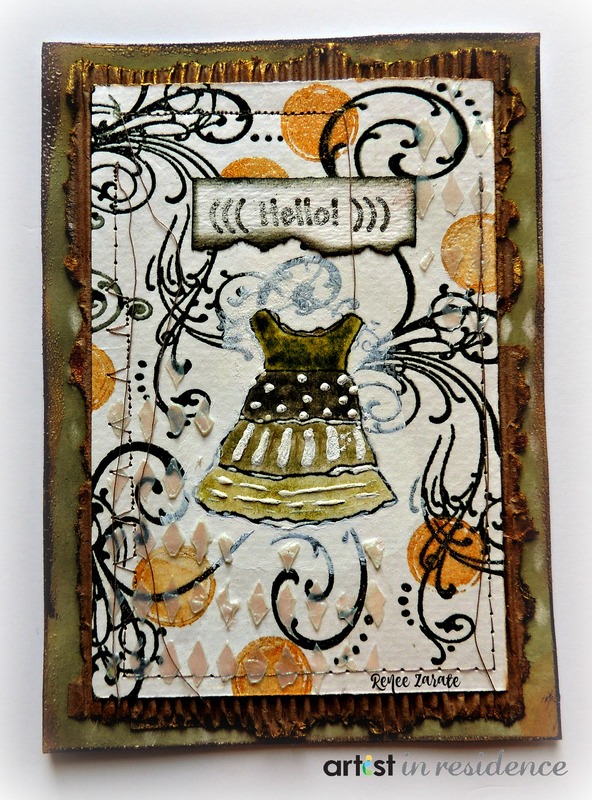 Make a small tag with a greeting on it, ink the edges using Northern Pine ink and glue it above the dress. Sew around the edges with a machine leaving some threads hanging. Glue this panel to a piece of cardboard card stock with the edges torn. 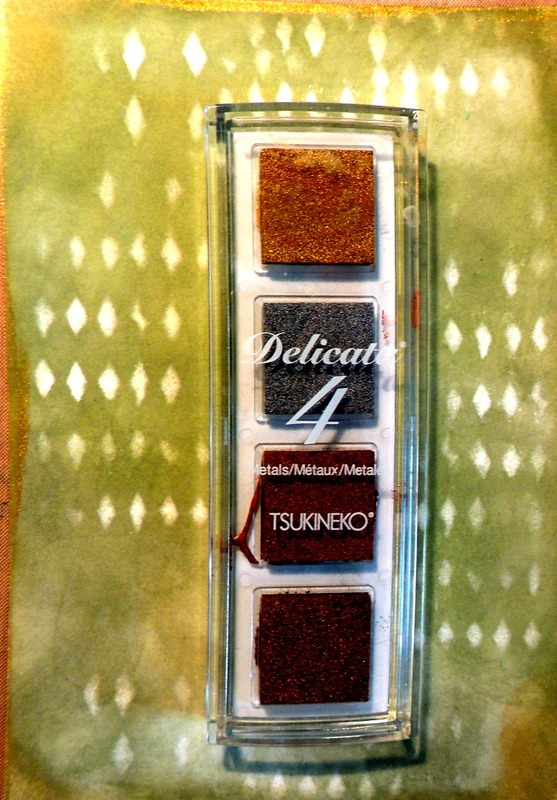 Ink the edges of the card stock with Delicata Gold ink. Finish by adhering the panel to the card with the master board back ground.